The arrival of Google Chrome 5 for OS X seems to have intensified the arms race among Mac Web browsers. Mere weeks after Google took its own admirable shot at the browser crown, Apple’s Safari 5 once again secures its place on the throne. The duration of its reign is anyone’s guess, but for now, you won’t find a faster, more powerful Mac browser than Safari. Once again, Safari 5’s biggest new feature is its increased horsepower. On a 2GHz aluminum MacBook with 2GB RAM and Snow Leopard, I tested Apple’s latest browser against Firefox 3.63, Chrome 5, and Opera 10.53. Safari trounced them all, with a few minor asterisks. Like all its rivals, Safari 5 scored a perfect 100 in the Acid3 Web standards test. Unlike the rest of the pack, Safari 5 seemed to stumble slightly in a compatibility test for CSS3 selectors, passing only 576 checks out of the possible 578. However, a Safari 5 security update document explains that the browser still supports the two selectors in question, which deal with visited links. It simply disables them in some situations to prevent malicious pages from automatically detecting which sites a user may have already visited. In XHTML rendering, Safari 5 ran roughly as fast as its predecessor, displaying a locally hosted test page in 0.58 seconds against Safari 4’s 0.54 seconds. In fairness, the difference could simply owe to random chance; other tests I ran at different times yielded even closer results. More importantly, Safari 5 thumped the competition here; Chrome took 0.78 seconds, Opera 1.67 seconds, and Firefox a decidedly odd 12.42 seconds. (Those scores are the lowest out of six consecutive tests for each browser, to rule out one-time hiccups.) Safari also topped a locally hosted CSS test, scoring 33 milliseconds against Chrome’s 51, Opera’s 193, and Firefox’s 342. Fastest times in bold. XHTML and CSS numbers are the fastest results out of six consecutive tests for each browser. This speed boost is even more impressive when you consider that Safari 5 has slimmed down to 56.7MB in size, compared to Safari 4’s 80MB. That’s far more svelte than Chrome’s 147MB, but still bulkier than Firefox’s 56.1MB or Opera’s lean, mean 36MB. 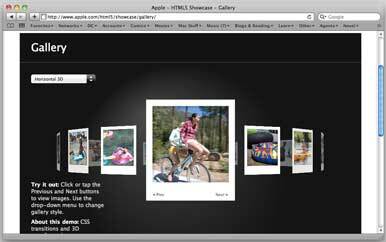 Apple’s drawn flak for the HTML5 gallery on its Web site, which insists that visitors need Safari to explore its plugin-free demos. In truth, development versions of Chrome can render some of the same tricks just fine. Others use code specifically favoring the WebKit rendering engine powering Safari and Chrome, and thus won’t work as well on other browsers. While that means Safari 5 can pull off slick animation, rotation, and transition feats, it’s also distressingly reminiscent of the proprietary tricks Microsoft built into previous versions of Internet Explorer. That browser’s lack of standards compliance made it the bane of Web designers. I’d hate to see Safari go the same route. Showoff: Safari 5 supports the latest HTML5 bells and whistles – including a few tricks some of its rivals can’t yet use. Apple also has yet to announce whether it will support the open WebM standard for HTML5 video, backed by Google with support from Adobe, Microsoft, Mozilla, and Opera, among others. Right now, Safari 5 can play HTML5 videos that use the H.624 codec without needing a plugin. But it doesn’t work with videos using the older Ogg Vorbis format, as Firefox, Opera, and Chrome do. That said, Apple has increased Safari 5’s compatibility with other undisputed HTML5 standards. Most notably, the browser now supports geolocation. In several tests at different demo sites, Safari 5 accurately located me on a map, and always asked my permission before giving away my coordinates. It’s also fair to note that when I visited the experiments page Google established to showcase Chrome’s HTML5 features, Safari 5 rendered every cutting-edge demo there without a hitch. Besides speed and compatibility, Safari’s light on new features. The biggest addition is the Reader button, which appears in the location bar in the same spot as the RSS icon. 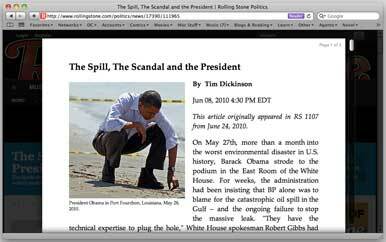 Click it while visiting a blog or news site, and Reader automatically displays a clean version of the main article, preserving related images but stripping away ads, navigation, and other distractions. Reader is also supposed to let you read an entire multi-page piece without having to click to advance to the next section. A touch dyslexic: The ballyhooed new Reader feature cuts clutter nicely, but doesn’t always work as advertised. A great idea in theory, Reader’s hit-or-miss in practice. Blog entries and multi-page New York Times stories displayed flawlessly. But a Slate piece didn’t show up correctly until I scrolled to the top of the page and reactivated Reader; a GQ article took roughly a full minute to load every part of a multi-page piece; and a Rolling Stone article displayed the current page’s content, but not the rest of the article. I’m guessing Reader can’t yet adjust for all the different ways sites display their articles. Apple says it’s aware of the problem, and it’s working on a fix. In addition, Safari 5 promises to support user-made extensions, as Chrome and Firefox do. While Apple won't post its own gallery of these add-ons until later this summer, you can already find a few of them on the Web. I’m glad to see Apple filling this glaring feature gap, but I wish Safari 5 had also borrowed a few more of its rivals’ useful innovations—particularly Chrome’s built-in language translation and HTML auditor, and Firefox’s site-level privacy features. Finally, Safari 5 happily ditches Safari 4’s unhelpful “Loading…” icon to restore previous versions’ useful big blue bar. It’s a welcome return for a browser rich in smart, user-friendly design. Tough competition has only made Safari 5 even better. Reader needs a little work, the proprietary CSS3 tricks aren’t quite kosher, and the jury’s still out on extensions. But until Google or someone else steps up for the next shot at the title, Safari 5 is still the fastest, sleekest, all-around best browser in the business.